When we first fostered and then adopted our current Scottie Hemingway, he was the barkiest Scottie I had ever lived with. He had a big, booming bark, and he was not shy about frequency of barking, either. 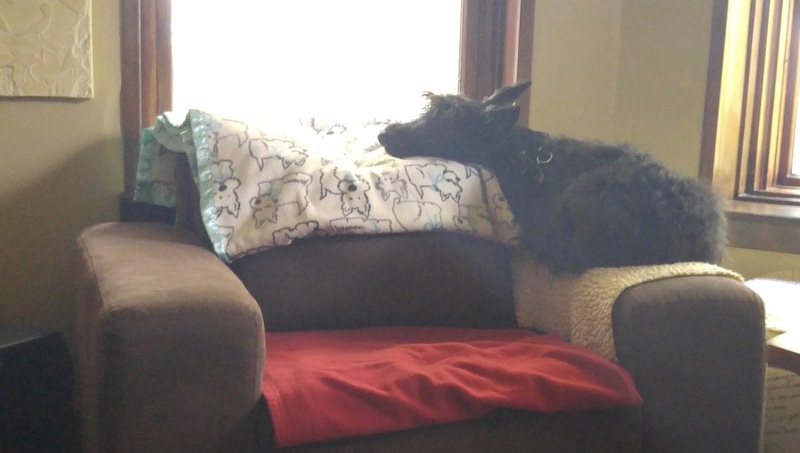 We have a chair we call the “dog chair.” I bet many of you do, too: this is a chair that is mostly reserved for your Scotties’ use, with a cover of some kind on it, probably located near a window they like to look out of. Most of our previous Scotties at times had barked when sitting on the back or arms of the dog chair, usually when another dog would pass by. But this was a minimum of barking, because when we’d ask them to stop, they would. But not Hemingway. We’d call his name, ask him to stop barking. He acted like he couldn’t even hear us! We’d soon be reduced to shouting his name: still nothing. Sometimes he’d stop if we clapped our hands, but usually we’d have to go over and touch him to get his attention, and he’d startle at our touch. Wow, I thought, he was THAT lost in his barking! And sometimes he’d start up again, and again he’d stop only if we’d go over and touch him. Outside, same story: We could not get him to stop barking. One of our neighbors for this reason lovingly called him “the mayor of the block,” because Hemingway seemed to be bossing everyone around. Reader, I have attended many dog behavior seminars. OK, I admit to being a junky. Suzanne Clothier, who holds seminars worldwide including in the Chicago area, is the canine behaviorist whose seminars I’ve most often attended. I remembered from her seminars that if a dog is not in what she calls the “think and learn zone,” often because they are too aroused or fearful or anxious, they cannot be expected to learn. I remembered, too, that once a dog reaches a certain level of arousal, it takes time for them to calm down. And that the best tack was first to help the dog avoid situations in which they became that overaroused, so that they were not “practicing” the overarousal, which would train their body to an ever higher arousal level as their normal state, leaving you eventually with one manic dog. I’d also taken classes in three of the levels to learn Clothier’s assessment tool, CARAT, and remembered that some dogs are wired so that they go into extremely high arousal faster and take longer to return to a more normal state. This, I thought, was Hemingway’s issue: He immediately became extremely aroused when he saw another dog or person, and then he was not able even to hear us, he was so strongly aroused. So I began working with Hemingway to moderate his arousal level, and to minimize his exposure to triggers that would set him off. In short, Hemingway was getting walked at quieter times of the day, when possible, and his dog-chair time was limited to those same more quiet times: in the middle of the day and after dark, when the fewest dogs and people were walking down our block. At the busier times, before people went to work or right after they returned home and would be walking their dogs, we would not walk Hemingway and also barred him from the room with the dog chair. What a great theory! We were seeing some changes. Hemingway was overall less frenetic in his arousal, and so was barking less. Outside, if he’d start barking, I’d stand with him between my shins to make him feel more secure, or pick him up. But the results were mixed from the new protocol, because Hemingway still did not respond to us asking him not to bark; we still had to touch him to get him to stop, both when he was inside and when he was outside. So the new protocol did help moderate Hemingway’s arousal level, but it failed to affect his non-responsiveness. We discovered the reason for this failure only after we had lost both of our other Scotties, first Maddie and then Toby, with whom Hemingway had lived ever since he joined our family. Suddenly, Hemingway no longer reacted when someone buzzed our door bell, something that used to start him and the other dogs barking and send them running to the door. He also no longer came if we called him within the apartment. Was he depressed, hiding out, I wondered? We’d have to go looking for him, and he’d often seem startled if we had to wake him. Then one day, when Hemingway was walking down the hallway in front of me, obviously looking into the rooms to see if he could find me, and he did not even turn around when I called his name repeatedly, a lightbulb finally went on. Hemingway is, and has long been, hearing impaired. He’d been using the other dogs to cue him in to certain things. He actually could not hear us when we’d been asking him to stop barking. He wasn’t responding to us not because he was too aroused, or “selectively hearing” as his then regular vet suggested (i.e., he was being “Scottie-stubborn”). Hemingway simply could not hear us. We’ve discovered that he can hear some things, like whistling, so now we whistle (using our lips) when we want him to stop barking. He immediately turns around and stops, and I signal “good boy!” He does sometimes hear clapping, but not always. He also responds to whistling when I’m walking him and he’s lagging behind. Previously, I’d been verbally asking him to come along, as I’d done with all my other Scotties over the years, but Hemingway had not ever responded, and I’d end up tugging him. It had gotten tiresome, this tugging—for Hemingway, too, I’m sure. Now I give two short toots on a plastic dog-training whistle (because sometimes it’s hard to lip-whistle outside against the Chicago winds), and Hemingway trots right up alongside me. I regularly use a few hand signals to communicate to him things like “Good boy” and “Thank you” and “Stay” or “Wait” and “Find it!” and “Do you want to eat?” and “Do you want to go out?” I found this video helpful as a starting point for developing my own few signals. I tell this story as a cautionary tale. I wish it had not taken me so long to realize what was happening with Hemingway. Behavior for our dogs is their primary way of communicating with us. But what are they telling us? Are we considering alternatives to our initial impression of what it is they are saying and why? Do we perhaps have in mind a stereotype of what a Scottie is—stubborn or strong-willed or tough or independent or aloof or any of the other descriptors we often see when we read about Scotties, whether in the breed standard or elsewhere? Or, as I did, do we cling too closely to advice from behaviorists or trainers, when we should realize that this often perfectly good advice does not explain and apply to every circumstance we experience with our Scotties. For example: If your Scottie is suddenly urinating in the house, what’s the cause? Is your Scottie mad at you? Punishing you? Upset that another dog visited? Or could it be a physical problem like a urinary tract infection, or the first sign of something like Cushing’s or bladder cancer? Or if your Scottie yanks their paw away when you are trying to groom the paw, is it because “Scotties just don’t like their paws touched,” or are you unintentionally twisting the paw, intent as you are on getting that paw trimmed just right? Or maybe your Scottie has a touch of arthritis, and having that paw handled in any but the most gentle way is really uncomfortable. I wish I’d remembered to ask myself what else could have been causing Hemingway to be so non-responsive to our verbal requests. It now seems obvious, in hindsight, and I hope I won’t make the same mistake again, with another behavior, another Scottie. Hemingway’s acting “like he couldn’t even hear us” was telling us the one big piece we needed to know: he actually couldn’t hear us most of the time. And since we’ve recognized that fact, we all are more content in our relationship. We’ve made certain adjustments—like getting Hemingway’s attention when we leave a room if he’s asleep—so that he now knows where we are all the time, and as a result his anxiety level has decreased even further. He now can hear us whistle to ask him to stop barking, and bless his heart, he stops every time, rarely starts up again, and the frequency of his barking has gone way down. And he’s back to enjoying the view from the dog chair whenever we’re home and he chooses to be there.